Hairstyle is a very personal presentation of not only your image, but YOU as a person and can be one of the most important things that you tell people about yourself. Whitney Johnson and Barb Horvath have sat down and answered some key questions and shared four things that one should consider when thinking about a hairstyle change. 1. Q: Does Face shape enter into a decision to change a hairstyle? What lengths go with what shape of face, bangs or no bangs, etc. Do you have to have long hair to cover up a long neck etc? 2. Q: You mentioned lifestyle…how big of a part does this play in choosing a style? A: Lifestyle always matters! If we are working with a new mom or mother of young children, you can’t give her a hairstyle that takes 45 minutes or more each day to complete. She won’t do it, and therefore she won’t feel her best, or be a good witness for your skills or your business. We have to be mindful of each client’s schedule and obligations as best we can. All of that is a huge part of why a consultation is so vital. We have to get to know our clients to know what realistic expectations can be. We have found that hair long enough to be pulled back is just as easy as a short, sassy, easy-to-manage style can be for the woman on the go. Whether she’s headed to the office, the tennis courts, or the carpool line, no woman today wants to be imprisoned by her hairstyle. 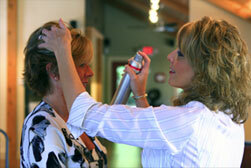 One key factor is to make sure that your client feels that her hairstyle is flattering and age-appropriate. Then she feels good about what you’ve done for her. 3. Q: How about color? How much of an impact will changing the color or even adding highlights make? A: Color can do a myriad of things for today’s client. We have seen that women of all ages are getting color added to their hair for as many varied reasons as the women themselves. Some do it to mask graying hair. Some do it for the body it adds to the hair. Others do it merely for the fashion of it. What we as stylists have to be constantly mindful of is helping guide the client toward the right shade of color, and whether or not to do some color in foils, or color all over the head, or both. Variation in color causes it to look current and natural, and professional. Matte- finished, or ‘one’ color tends to make the color appear less natural, and more manufactured. Some clients choose to add a color service just for the way it makes them feel. You’d be surprised at the number of clients that just need a ‘pick-me-up’, and a few glowing foils of highlights, or a few lowlights in lighter hair, has been just the answer. The key factor in any color service is making sure that the result compliments the client, and that they feel good about the results. 4. Q: Anything else that one should consider when changing a hairstyle/look? A: We have found over the years to just have a thorough conversation with the client before anything drastic is done. Make sure it’s not an emotional reaction to something else going on in their lives. Make sure that what the client is asking you to do with their hairstyle is actually possible with their hair. We can teach clients styling techniques to go with a new look, but we just have to make sure that the expectations are realistic, and that we’re on the same page.